Cal Ripken, Jr. is not known for his statistical career. Even though he was an outstanding offensive player, most baseball fans would probably not be able to list many of his career offensive totals. Ripken is known for how consistently he played the game and for his refusal to take a day off. He holds the world record for most games played in a row: 2,632. Ripken was born on August 24, 1960 in Havre De Grace, Maryland. He was born into a baseball family with his father being a former player, coach, and manager with the Baltimore Orioles, and later also his brother, Billy, who played professionally for multiple teams, including Baltimore. Ripken played high school ball at Aberdeen High School. He did not play at a collegiate level because he was drafted by the Baltimore Orioles in 1978 at the age of 17. He would play his entire 21-year career with Baltimore. Ripken became a part of baseball history even before he broke into the “big leagues.” In 1981, while a member of the Rochester Red Wings, the Orioles' Triple-A farm team, he played third base in the longest professional baseball game in history. The game against the Pawtucket Red Sox lasted 33 innings and had to be completed over a period of three days; Ripken played in every inning. Even at this early stage in his career, he was displaying a legendary work ethic. Ripken debuted with the Orioles as a third baseman but was quickly moved to shortstop. He finished his rookie year in 1982 with a .264 batting average, 28 home runs, 93 runs batted in (RBIs), and the American League (AL) Rookie of the Year award. That year he also started his streak of consecutive games played, a streak that would not end until 1998. Ripken completely bypassed the famous “sophomore slump” in his second season. He hit .318 with 27 home runs and 102 RBIs, and this time he won the AL MVP award. Over the next 12 years, Ripken played great baseball. He hit over .300 three times, clubbed at least 20 home runs nine times, drove in at least 80 RBIs ten times, and had a career-high 34 home runs, 114 RBIs, and won another AL MVP in 1991. However, it was 1995 that held the ultimate highlight of Ripken's career. 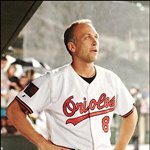 On the evening of September 6, 1995, Ripken played his 2,131 consecutive game, breaking Lou Gehrig's 56-year-old record. Once the record became official in the fifth inning, fans at Baltimore's Camden Yards gave Ripken a 22 minute standing ovation, and teammates convinced the humble Ripken to take a lap around the field to acknowledge his adoring fans. The next year, Ripken broke another, lesser publicized record. On June 14, 1996, he surpassed the world record for consecutive games played (2,216) held by Sachio Kinugasa of Japan. Ripken's streak has been credited by some as a major reason fans stuck with baseball after the game was marred by a strike during the 1994. The Streak helped restore interest in fans that felt let down and rejected by their beloved sport. The Streak came to an end on September 20, the last game of the 1998 season. The Orioles were playing the Yankees at home in Baltimore. Once everyone realized what was happening, and after the first out of the game was recorded, the fans and the visiting Yankees gave Ripken a standing ovation. Ripken continued to play through the 2001 season, joining the 3,000 hit club in 2000, and batting a career high .340 in limited playing time in 1999. He finished his career a 19-time All-Star with 3,184 career hits, 431 career home runs, 1,695 career RBIs, and a .276 career batting average. He was nearly unanimously voted into the Hall of Fame on January 10, 2007.